Dimensions 1.30 by 6 by 9 in. Amazon.com description: Product Description: The essential book to understanding Donald Trump as a businessman and leaderâand how the biggest deal of his life went down. Now, Barrett's classic book is back in print for the first time in years and with an introduction about Trump's 2016 presidential campaign. Donald Trump claims that his success as a âself-madeâ businessman and real estate developer proves that he will make an effective president, but this devastating investigative account by legendary reporter Wayne Barrett proves otherwise. Back in print for the first time in years, Barrettâs seminal book reveals how Trump put together the biggest deal of his lifeâTrump Towerâthrough manipulation and deceit; how he worked with questionable characters from the mafia and city politics; and how it all nearly came crashing down. Here is a vivid and inglorious portrait of the man who wants now to be the most powerful man in the world. 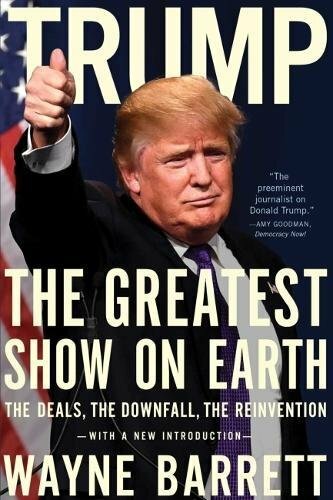 InÂ Trump: The Greatest Show in the WorldâThe Deals, the Downfall, the Reinvention, Barrett unravels the myth and reveals the truth behind the mogulâs wheelings and dealings. After decades covering him, few reporters know Trump as Barrett does. Instead of the canny businessman that Trump claims in his own books, Barrett explores how Trump exploited his fatherâs banking and political connections to finance and grease his first major deals. Barrettâs investigative biography takes us from the days of Donaldâs lonely youth to his brash entry into the real estate market, and to the back room deals behind his New York, Atlantic City and Florida projects. Most compellingly Barrett paints an intimate portrait of Trump himself, a man driven by bravado, obsessive self-regard, and an anxious ruthlessness to subdue his rivals and seduce anyone with the power to aid his empire. We see him head to head with an opponent as powerful as Pete Rozelle, ingratiating himself with the brooding governor on the Hudson, and fueling the Drexel engine driven by Michael Milken with hundreds of millions in feesâpaid, ironically, by gaming companies to fend off Trump takeovers. We explore his complicated emotional and business relationship with his first wife, Ivana, and the use he planned to make of his mistressâand later, his second wifeâMarla Maples as a âsouthern strategyâ in his then contemplated presidential campaign. With interviews with scores of adversaries and former colleagues, we are given a privileged look at Trump the businessman in actionâreckless as often as he is brilliant, reliant on threats as much as on charm, and ultimately a cautionary tale: is this the man we want to lead the world?